Members of the Lynchburg-Clay Mustangs varsity Softball team gathers for a team photo in the Lynchburg-Clay High School gym. The team consists of Sierra Benney, Jasmine Dearwester, Amber DeBoard, Ashley Ernst, Chelsea Hart, Brooklyn Humphrey, Sam Kirby, Aaliyah Knight, Morgan Parks, Serena Smith, Haleigh Snider, Kylie Vastine and Serah Whitacre. 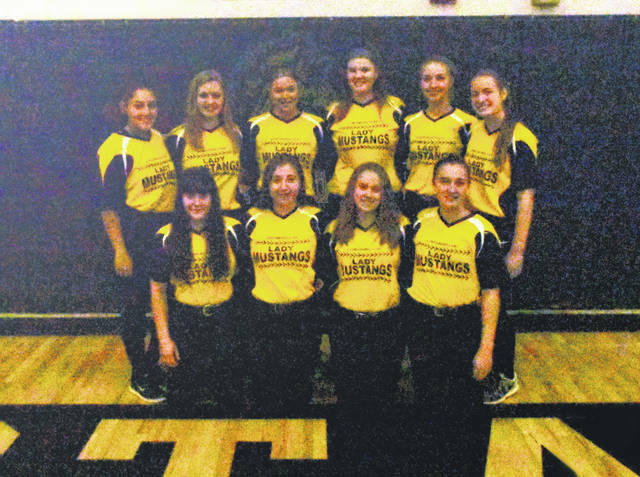 The Lynchburg-Clay Lady Mustangs varsity Softball team is aiming to increase their win total in 2019 after finishing 8-11 overall and 6-7 in Southern Hills Athletic Conference play. The 6-7 league record for the Lady Mustangs ranked second in Divison one of the SHAC behind the Lady Warriors of Eastern who finished 13-0 in league play. Experience will play a key role for the Lynchburg-Clay ladies with Seniors Jasmine Dearwester, Chelsea Hart, Brooklyn Humphrey, Sam Kirby, Morgan Parks, Kylie Vasteen and Serah Whitacre all returning for the Lady Mustangs in 2019. Despite finishing 6-7 in the SHAC the Lady Mustangs showed the ability to play well especially late in the season when they scored 42 runs over the stretch of three games including a 21 run outburst in a victory over the West Union Lady Dragons. Truman said that being more consistent at the plate and in the field are both things that Lynchburg-Clay is striving to accomplish this season. The work that the Lady Mustangs are putting into getting better is something that they take pride in and believe will give the team an advantage this season. Lynchburg-Clay will need to use all of their skills on the field as well as be prepared mentally for every game that they play this season if they want to be successful and Truman has used the teams goals to achieve physical and mental preparation. The Lady Mustangs will have the opportunity to show that their hard work has paid off early in the season as they play 14 games between the start of the season with a double header against the Georgetown Lady G-Men on Saturday, March 23, and a SHAC road game against the Eastern Lady Warriors on Friday, April 12. During that stretch the Lady Mustangs will travel to take on SHAC Divsion II foes the Fairfield Lady Lions and Peebles Lady Indians who finished last season with identical 10-3 league marks. In addition to those road tests Lynchburg-Clay will also host the Fayetteville Lady Rockets who also finished the 2018 SHAC season with a 10-3 mark in Division II on the third day of the season and will also host the Eastern Lady Warriors on Thursday, April 4. If the Lady Mustangs are able to endure the initial wave of their schedule and emerge with a .500 or better overall record they will be in position to finish above board in the SHAC in 2019 with their last three home league games against Whiteoak, West Union and Ripley who finished 2018 with a combined league record of 8-31. One thing is for sure the Lady Mustangs are going to work hard and play hard regardless of the situation and Truman wants the community to come out and see the fruits of her team’s labor. https://www.timesgazette.com/wp-content/uploads/sites/33/2019/03/web1_LCHS-Softball-2019.jpgMembers of the Lynchburg-Clay Mustangs varsity Softball team gathers for a team photo in the Lynchburg-Clay High School gym. The team consists of Sierra Benney, Jasmine Dearwester, Amber DeBoard, Ashley Ernst, Chelsea Hart, Brooklyn Humphrey, Sam Kirby, Aaliyah Knight, Morgan Parks, Serena Smith, Haleigh Snider, Kylie Vastine and Serah Whitacre.